I used a pair of size 8 needles, but a little smaller or bigger is okay. This one is about 8.5″ square, or mostly kinda square. I’m still pretty new to knitting. The dirty dishes don’t mind that things are a little off. Since you are knitting it on the diagonal, you can move to R3 whenever you decide the size is good for you. Every stitch you add will mean two more diagonal rows in your dishcloth. This is actually hat #2 for Alex. He lost the first one shortly after he got it. The pattern is a freebie from Michaels. It’s an easy pattern. I started it at my daughter’s basketball practice last night and then finished it when I got home. The yarn was a super bulky wool, so it knit up very quickly. Sorry about the camera phone pic, I wanted to grab a picture before I gave it to him and that was easiest. I wanted to knit this in the round, so I cast on 52 rather than 50 stitches and did 8 rounds of ribbing. When switching to the 13s, for the first round, it was K13, K2tog, K22, K2tog, K13. Then I knit a round and then for the next round it was K13, K2tog, K20, K2tog, K13. I followed the pattern from there, just replacing the purl rows with knit rounds. Oh, and I left off the pompom. I didn’t think Alex would appreciate a pompom. This hat comes down far enough to cover the ears. It doesn’t look like it will in the pattern picture, but it does. We’ll see how long he keeps track of this one. Since I’ve been making scarves, I thought it would be nice to make hats. Trying this on a smaller scale seemed like a good way to start, so I found a pattern for a hat for my daughter’s American Girl doll. I had some yarn leftover from Zoe’s scarf, so I tried using that, following the directions here. However, the pattern is not written for bulky yarn, and this is the result. Zoe likes it because she thinks it looks like a beret. However, it is so loose that it is very likely to fall off when the doll is picked up, which is not a good feature. Using a size 6 needle, I cast on 42 rather than 66 and tried again. I used a size 8 needle for the larger needle in both attempts because I don’t have a size 9. This time it fit. Zoe hasn’t seen the second version. I still have a bit of yarn left, so I’ll make a matching scarf and give her the set for her birthday. There is a really cute sweater on the same pattern page, but I’m not feeling brave enough to tackle a sweater yet. Simple projects I can do while watching the kids at hockey or basketball practice are perfect right now. This yarn is called Serenity Chunky Weight from the Deborah Norville Collection. The colorway is PuppyDogTails. Next post will be sewing again! Here’s my first scarf. This one is for my daughter. The yarn is from premier yarns and it’s called Serenity Chunky Weight. It’s a bulky #5 yarn. This is an acrylic variegated yarn called Puppy Dog Tails. It’s basically like a really long dishcloth, since the stockinette stitch dishcloth was the first thing I learned to do and this was my second project. I’ve since learned that if I had done a purl stitch at the beginning and end of each row, it wouldn’t try to curl under. The yarn is super bulky Lion Brand Wool-Ease Thick & Quick in #149 Charcoal. It’s an 80/20 Acrylic/Wool blend, so it can be machine washed and dried. That’s important around here. This knitting thing is working out pretty well for hockey practice! Learning to knit – my stitches are leaning! 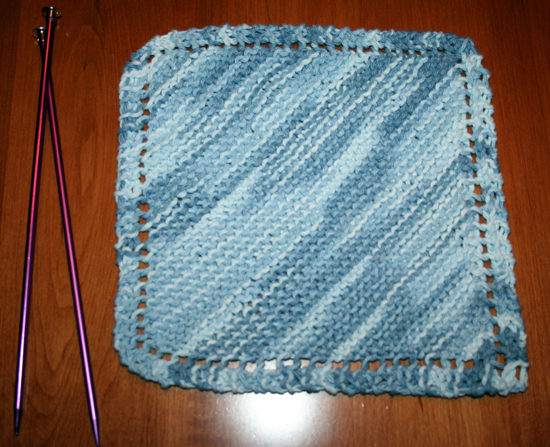 I finished my dishcloth the other day and took it to class last night. It’s amazing how long it took to make such a small thing, but I’m excited to have a portable craft for hockey season. The instructor looked at it and said it didn’t look right, so she watched how I was purling, thinking I was doing that wrong since that was what I taught myself with the help of knitpicks.com and youtube. As it turned out, my purling was correct, but I was knitting through the back loop rather than the front. This caused all my knit stitches to lean. The kids have three days off school, I have a million projects in my head and they have the living room covered in Hot Wheels cars. Yikes!